Although we have bookshelves bursting with cookbooks, I strongly believe that some of the best recipes come from the heart and family. Last week Art and I were visiting his tia Esperanza out in Compton. She has one of those classic Mexican homes with a manicured front lawn and a walkway lined with large bushes of chile peppers. You enter the living room and the large screen TV is blaring a novela on Univision and the aroma of good home Mexican cooking fills the air. The back yard has more than eight fruit trees, including papaya, mango, avocado, lemon, lime, orange, and tall, thick stalks of sugar cane growing wild. I love Art’s tia because she always insists we eat something when we visit even with half-hearted protests that we already ate. A few weeks back she quickly whipped up fried tacos filled with crispy potatoes and topped with a red chile sauce. To be polite, I said I would have one. Four tacos later I unbuttoned my pants to make room for the pan dulce she served with NESCAFÉ. This past week she made us burritos on soft hand-size flour tortillas filled with homemade frijoles and nopalitos mixed with a fiery hot green salsa. I loved the flavor and simplicity of the dish. I asked her about working with nopales and Tia Esperanza generously shared with me in Spanish her recipe for nopalitos cooked with pork chops in the same hotter than hell green salsa. 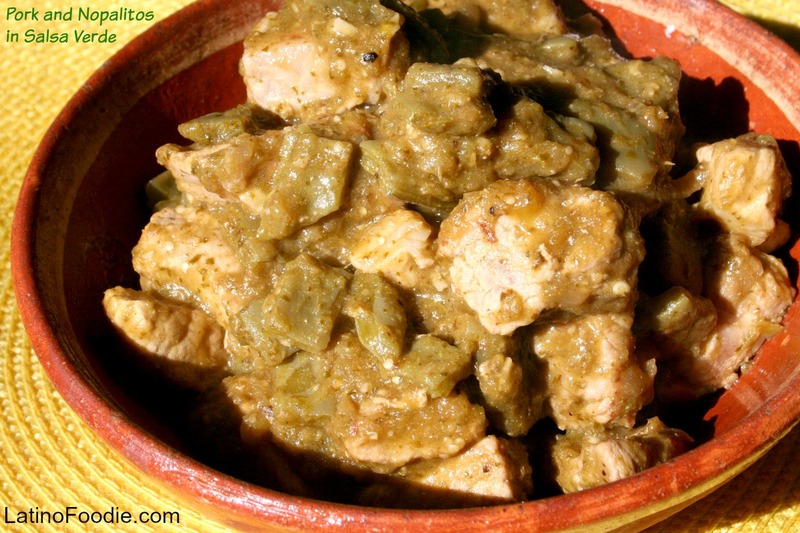 Tia Esperanza doesn’t write down recipes (my kind of cook) and my Spanish isn’t always the best, but from my mental notes and experience working with pork and green chile this recipe came together wonderfully. I think it comes from a place of love that only an aunt can share and that’s why it tastes so good. Serve it alongside some pinto beans, Mexican rice, and warm flour tortillas. Pour yourself a tall glass of limonada to wash it down. Heat the oil in a large skillet. Add the pork and sear until lightly browned. Add salt, water and simmer until the pork is tender, about 30 minutes. The liquid will evaporate. You’re going to want to brown the pork. Remove from heat and set aside. 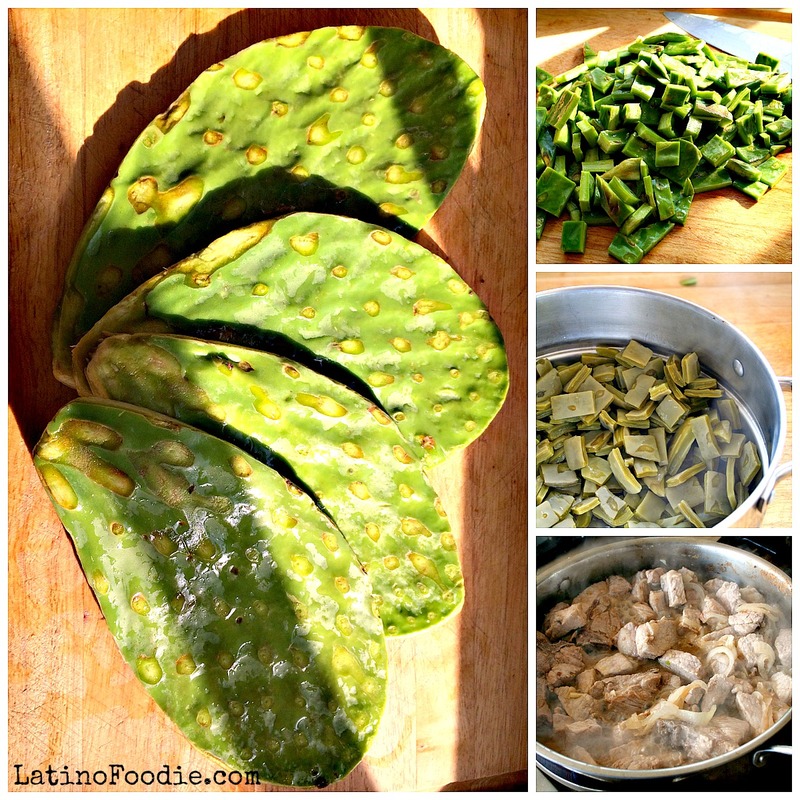 Trim and peel nopales; cut into 1- by 1/2-inch pieces. In a separate saucepan, bring 1 quart of water to a boil. Add the nopales and simmer for 10 minutes. Remove the nopales from the heat, drain and rinse with cold water. Dice the nopales. Add the salsa verde sauce and the nopales mixture to the pan with the seared pork. Simmer for 10 minutes and with a wooden spoon scrape up all the good brown bits for added flavor. Season with salt and pepper. Did you use a prepared salsa verde or homemade?